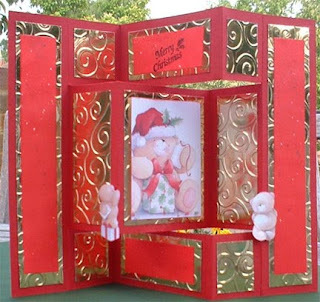 I saw this card on Create and Craft TV, and love the folds. This one was for a friend on the Cricut MB who had a birthday this week. 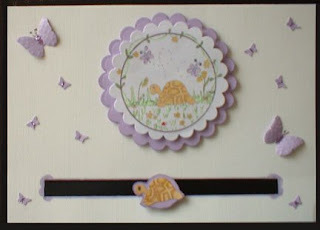 I also made the same card in lilac for another friend. This is my first Tri Shutter card and was very easy to create. The swirls are the cuttlebug folder Divine Swirls. I have realised that to take a decent photo when using mirri card you need to go outside. This week's challenge on the UK Crafters thread on the Cricut MB was to use swirls so this fits the bill and maybe I can find another challenge for using a cuttelbug folder. I have been trying out some different things this week and thought I would try the bleach technique. First I stamped the rose on pink card and then went over parts of it with a brush. Before I got halfway through the bristles on the brush had dissolved, obviously I was using the wrong type of brush! A cotton bud was the next thing to try and that worked well. 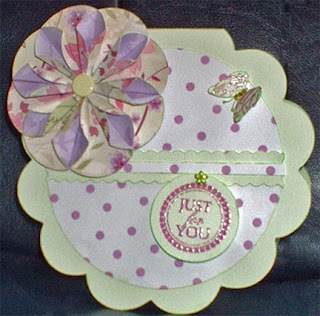 The card and the scallopped mat are cuttlebugged with a Fiskars plate. This will be my card front for the September swop on the Cricut MB. AMENDED TO ADD it is better to heat emboss the image to make a ridge to stop the bleach spreading out where you do not want it. 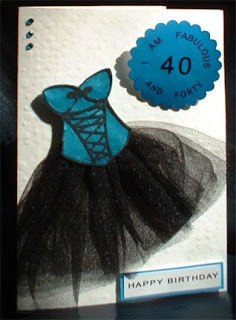 Rosy is 40 today so she deserved a special card. The corset is a cut file for SCAL, it is a bit flimsy to get off the mat but worth the effort. My sister-in-law had recently shortened a prom dress and given me some of the satin that she had cut off so I thought it would be perfect for this dress. The badge is something I designed in Photoshop and it does have a pin on the back so it can be worn. I found a great file to use in photoshop for doing circular text, you just enter your own text and it is all set up for you. 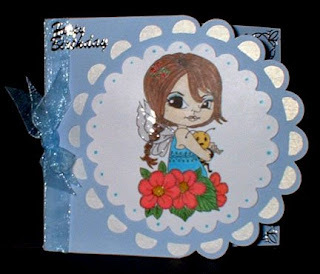 I was so pleased that this week's challenge at polkadoodle was to use a flower on a circle card as I love making flowers. This one is made using circles and a bit of folding, I think it is one of the prettiest flowers you can make, the brad in the middle is green with spots although it looks yellow! The butterfly is an MS punch which I stamped and embossed then added tiny beads for the body and stamens for the antennae from my cake decorating stash. 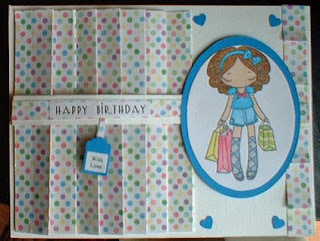 The card is from a Cricut cut file designed in Design Studio and the spotted paper is from Polkadoodles. I am loving making these aperture cards although this gave me a few problems as the nylon thread would not stick, but I persevered and got there eventually!!! It is for my daughter and son-in-law whose 21st wedding anniversary is this week. The apertures were cut with nesties, and for the hearts I punched 4 for each, stuck them together sandwiching the thread in between and stickled the edges. For the letters I used George and the Cricut and the tiny weeny bows were made using the 'fork' method. On the inside of the card the words say 'Love brought you together as husband and wife and gave each of you a best friend for life', 'Happy Anniversary'. 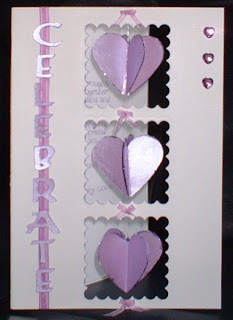 This is the first penny slider card I have made and it was so easy that I will certainly be making more. August is a busy time for birthdays! 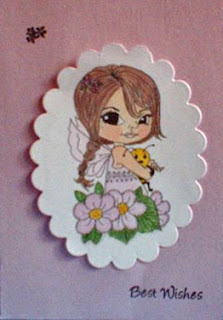 The first two are using the lovely Tara image, free from http://victoriacasestamps.blogspot.com/ , with the second card cut from the Wild Card cartridge. 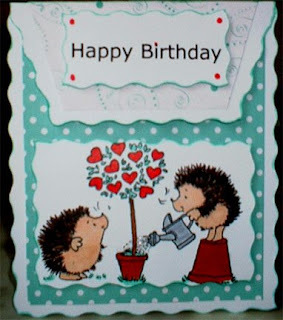 The third card was cut with my paper trimmer and uses the sweet hedgies from Penny Black stamps and papers from Papermania 'The Big One'. These hedgies were very naughty as I left them on my worktop to let the water droplets dry and they jumped down the back! I had to take the worktop off and pull out the drawer units only to find that I could have reached them with my tweezers!! !